ISTANBUL, TURKEY — The flight from New York to Istanbul was long but Turkish Airlines has excellent service reminiscent of the golden era of air travel — which was a welcome change from the usual cattle class treatment. The food was “good” by airline standards with vegetables and fruit and recognizable meat, and I was even able to get some sleep. The sleep was very valuable since I had some plans for my long layover. Rather than hang out in the airport I decided to take a quick visit to Istanbul — a city I had really appreciated when I was there many years ago. It fit into my Silk Road theme, and I thought it would be a nice way to use the eight hours between flights. There wouldn’t be time to do anything more than a quick loop into the historic old center, yet I looked forward to revisiting the iconic sites. With no specific schedule, I didn’t really mind the traffic as it gives me plenty of time to see the changes in the city where once there were only a few tall skyscrapers there are now many and the modern business district looks similar to all the other modern glass-and-steel-skyscraper-metropolitan centers around the world. I was told that there are over 50 shopping malls within the city limits. Luckily the “old” Istanbul is protected as a UNESCO World Heritage zone to preserve it from the urban sprawl that surrounds it. The distinctive skyline was built up over many centuries and encompasses most notably the Hagia Sophia, the Süleymaniye Mosque and the Blue Mosque. I had hoped to photograph it at sunset, but the sky was not so cooperative and there wasn’t really a “sunset.” I made do with a diffused light at dusk that was beautiful too. 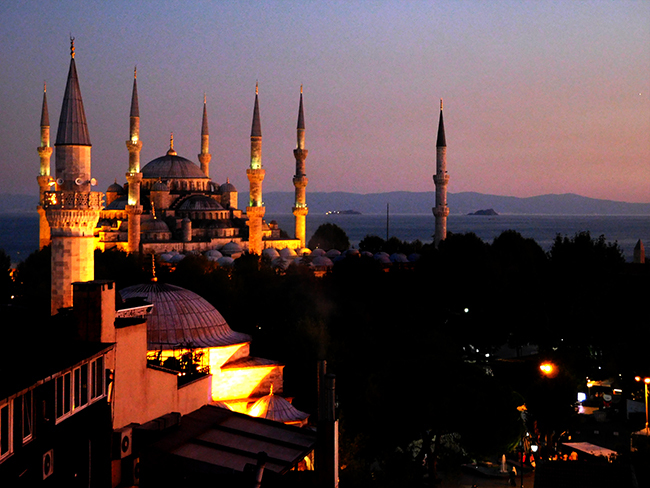 Known as Constantinople in Roman times, Istanbul served as an imperial capital for almost 16 centuries. It’s population has always been cosmopolitan and it remains an important international cultural center today. Approximately 12.56 million foreigners visited the city in 2015, making it the world’s fifth most popular tourist destination according to Wikipedia. As evening settled in I wandered around the pedestrian area where tourists lingered within sight of police and security forces deployed to protect the area from more sinister menaces than urban sprawl. Though there seemed to be plenty of foreign visitors, I was told that recent events had caused a big drop in the number of tourists and the local businesses dependent on them were suffering. The fountains were lit up and the minarets of the mosque stretched into the black night sky with just a sliver of crescent moon to light it. I thought about the historical city that connected two continents. Straddling the Bosphorus strait between the Sea of Marmara and the Black Sea, Istanbul’s geographic position made it a crossroads for cultures and civilizations since ancient times. This was the terminus “destination” for the Silk Road caravans coming from Asia, and for me it was the starting point of my “Silk Road” journey.